Hey! It has been long time since I posted my previous post at ABT, so today I am back with yet another post which teaches you how you can split up your blogger post into different pages just like in blogs like Mashable and other WordPress blogs. To create engagement and to divide the posts in section this method can be very useful. Also if you have a very long post you may use this method so the long post will now be splited into many shorts pages. Once you have seen the demo to split up your post what you need to do is just follow the below steps. Now replace Add content here with the text you want in the respective pages and publish the post. There are some points you need to note as they are very crucial for this particular splitting. It is preferred that you first draft the post and at the last point add this code and make respective changes as due to changing of tabs from Compose to HTML and vice versa the code may automatically get changed. You may have got the idea of the code pattern and I guess one can add more pages if they want (here the tut is given only for 3 pages) in case you have any problem drop a comment below and I will try to help you as soon as possible. Thats it, you are done now. Now you and your visitors can see long posts divided just as you would see in WP posts. Hi ,This is amazing .Exactly what I wanted.Thank you so much. But unfortunately one of the templates (infinite responsive blogger template) i use seems to have problem with this.Well basically with links .all hyperlinks breaks lines.If a sentence has a link then the line breaks after the link and the rest of the text is pushed to the next line.Something wrong with the CSS.So the numbering of pages appear vertically instead of horizontal.I cant figure it out but i guess its something to do with Display:block.Any help would be deeply appreciated. Thanks a lot for this.Is there a way to make this into "next page " and "previous page" instead of numbers? Thanks for this informative post, I always wondered what Opera was Now I know. I haven’t done much on the WordPress front but after reading this it looks like something I could really do. Thank you so much! Can you please tell me how to make 5th page, I actually need 12 pages....so, just if you can show me what changes after forth in code...Thank you in advance. I was talking about mistake in "Different" word. Into title. Thank you it works however I want more than 3 pages. How can I do that? Though you have been back to the blog after a longtime since your first post, it is really good to see you to be back with a Bang. Yes, really as i am telling like this means, now-a-days,even the students who are all approaching the online research paper writing service websites are not willing to study the essays and writing works finished by them if they are in long paragraph format. So,this post will be very helpful for the bloggers like me to attract the visitors of the blogs by posting in an attractive manner. Hats off for such a beautiful article. Willing to see such more quality posts from you in a frequent manner. But, as on seeing this post, the time taken by you for this post seems to be a correct one. wow it work well for me, i just did some little twiks on it.thanks! Hey bro, Please tell me how to increase infolinks earning ? I am getting goof amount of traffic on http://rechargendeals.com but my CPM is too low. What to add in place of '#'? And how can we change next page button color? 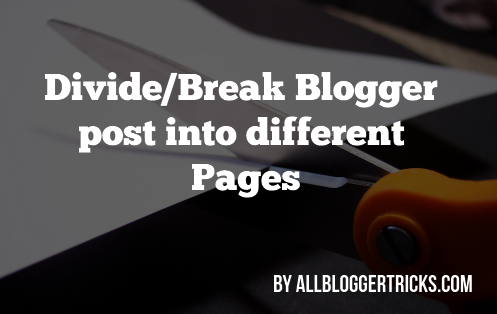 Divide/Break Blogger post into "differernt" Pages. Please is there any way to make the page reload... so ads on the page can equally reload?? This is an awesome tutorial for beginners. Thanks for sharing will try on my blog. Funny scary horror prank video you can't stop your Laught after watch this video. Information is good in the post, it is very usefull. Awesome Tricks For Beginners This is So Helpful For all those Who Start their Business in Beginning. what is your template name? Thanks for Sharing Useful information with us..!! very nice blog. i was searching for this guide only, thank you! Not working please help,code is placed successfully plus the jquery script but when i click on page 2,3,4....it's redirecting me to the TOP of the first page and only page 1 working not others. Hi is there a way for me to have previous and next button instead of numbers? thanks! Hi, Can you paste the code only for 2 pages? That's really great that you have mentioned on this page. Here are the latest government jobs in India. Thanks, it worked. Easy to follow and got what I wanted.